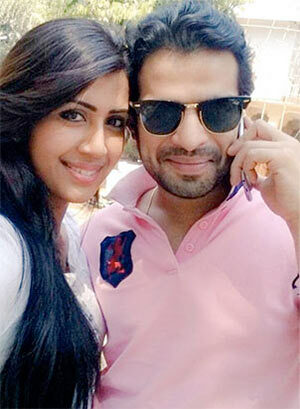 Rediff.com » Movies » Karan Patel, Ronit Roy, Deepika Singh: TV stars' REEL and REAL spouses! Can you identify the real-life spouses of some of your favourite TV stars? If you are an active lover of Hindi TV shows, you probably have your own list of your favourite onscreen couples, who star in the popular shows. Isn't it a bit curious, then, to spot said stars with their real life spouses? 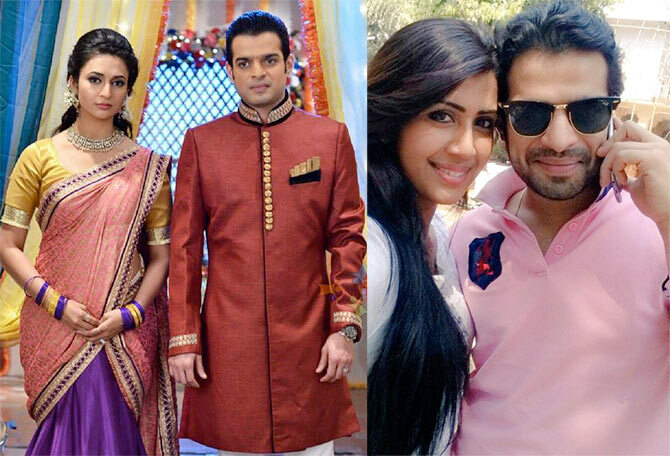 Here, take a look at the REEL and REAL partners of some of your favourite TV stars! Karan Patel, who plays loving husband Raman Bhalla to Divyanka Tripathi's Ishita in Yeh Hai Mohabatein, recently got engaged to actress Ankita Bhargava (right). 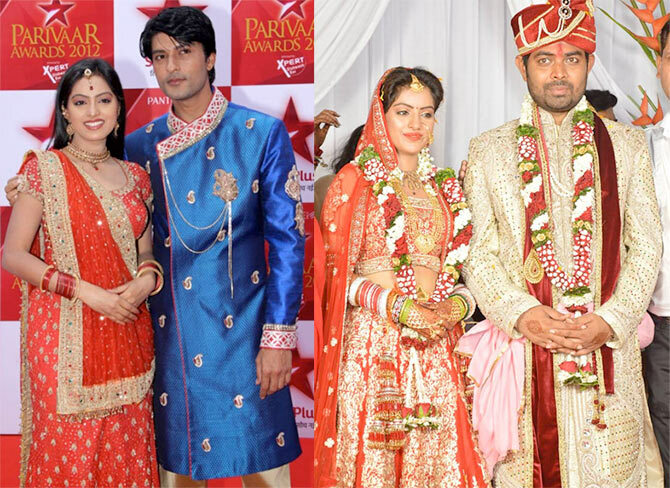 Deepika Singh, who has won the hearts of fans of her TV show Diya Aur Baati Hum as Sandhya, is married to costar Anas Rashid's Sooraj. In real life though, the actress married her show's director Rohit Raaj Goyal (right) in May last year. 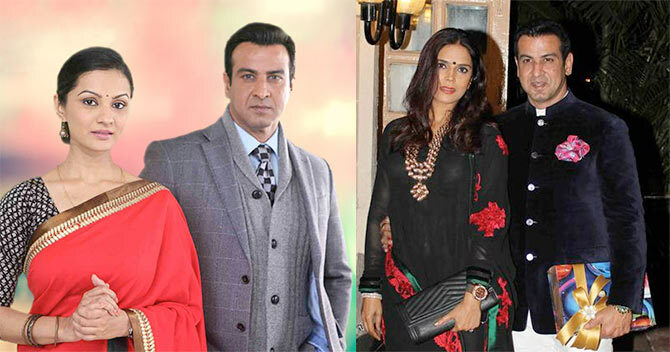 Ronit Roy's return to television saw him paired opposite Pallavi Kulkarni in Itna Karo Na Mujhe Pyar. In real life, he is married to Neelam Singh (right) and the couple is a regular fixture at many social dos. Yeh Rishta Kya Kehlata Hai's male protagonist Naitik (Karan Mehra) makes a cute onscreen couple with Akshara (Hina Khan). His real life wife Nisha Rawal (right) is equally striking. The pair was even a part of Nach Baliye 5. Rajat Tokas, who plays Akbar the Jalal in Jodha Akbar, complements the serenely regal looks of his costar Paridhi Sharma, who plays Jodha. The actor's wedding (right) to girlfriend Srishti Nayyar, held in Udaipur a while ago, was befitting the emperor he plays on screen. 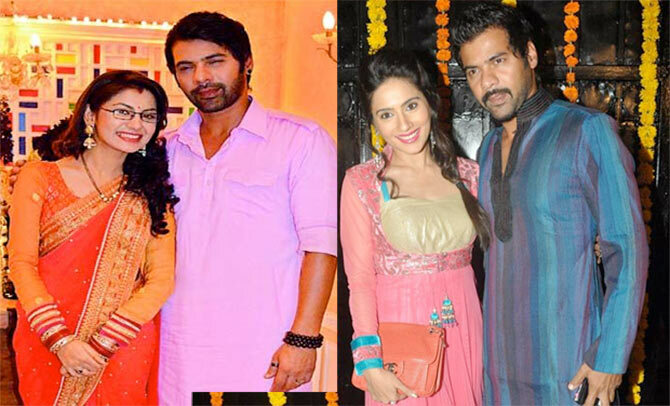 TV's bad boy Shabbir Ahluwalia has been paired with actress Sriti Jha in their currently on air serial Kumkum Bhagya. Shabbir's real life spouse, the extremely adorable Kanchi Kaul, is a well known actress in her own right. The duo tied the knot in 2011. Zee TV's show Qubool Hai, before the time leap, featured Raqesh Vashisth and Surbhi Jyoti as the protagonist couple. In real life though, Vashisth is married to actress Riddhi Dogra (right). Love struck for the two while they were shooting for a previous show Maryada on Star Plus. 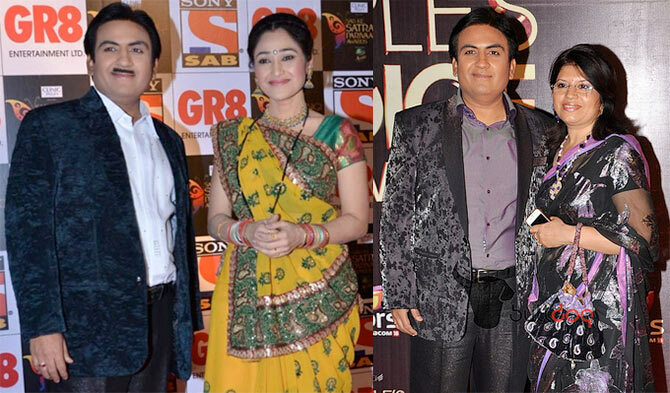 Veteran actor Dilip Joshi's Jethalal and his onscreen wife Daya's antics in Tarak Mehta Ka Ooltah Chashma are quite endearing. The actor is married to Jaymala Joshi in real life. The couple have two kids -- a son and a daughter. Nakuul Mehta made a striking couple with Disha Parmar in Star Plus's Pyar Ka Dard Hai Meetha Meetha Pyaara Pyaara. He is married to Janvee Parekh (right) in real life. 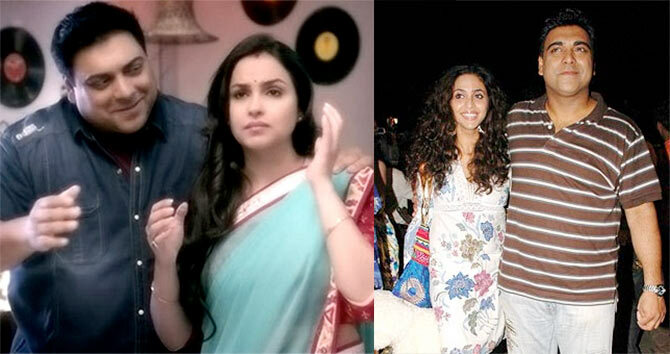 We round off this list with Ram Kapoor, whose new show Dil Ki Baatein Dil Hi Jaane sees him paired with Gurdeep Kohli. His real life wife Gautami Kapoor recently made her TV comeback with Star Plus's Tere Sheher Mein.